The United States reacts warily to reports that PA Prime Minister Salam Fayyad would resign because of a dispute with Mahmoud Abbas. The United States on Thursday reacted warily on Thursday to reports that Palestinian Authority Prime Minister Salam Fayyad was poised to offer his resignation to Chairman Mahmoud Abbas after a dispute between the two, AFP reported. Similar reports have surfaced in the past. Rumors that the U.S.-educated economist would either resign or be told to step down by Abbas have been rife in recent weeks following the high-profile dispute between the pair over the government's hiring and firing policy. However, a senior official at the U.S. State Department poured cold water on the idea, telling reporters he did not believe Fayyad was on the verge of resigning. "He's not tendering his resignation to the best of my knowledge. He's not doing it," the official said on the sidelines of G8 talks in London. "As far as I know he's sticking around," added the official. A top State Department official later added, "We have no new information to suggest his resignation, but any confirmation of his plans would have to come from him or his team." Abbas, who returned to Ramallah from Doha on Thursday, had been due to meet his prime minister for evening talks "to settle Fayyad's resignation", senior Fatah official Azzam al-Ahmed was quoted by AFP as having told Voice of Palestine radio. The meeting, however, was called off following the senior U.S. official's remarks, according to AFP. "The meeting planned for Thursday evening has been postponed until further notice," a PA source told AFP, without giving a reason. Longstanding tensions between Fayyad and Abbas peaked on March 2 when the PA’s finance minister, Nabil Qassis, announced he was standing down. Abbas, who was abroad at the time, rejected the resignation but Fayyad agreed to it. 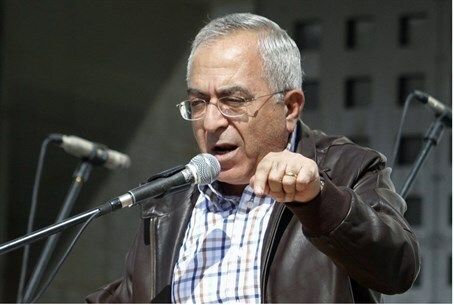 Last week, the Fatah Revolutionary Council for the first time openly criticized Fayyad's government over its economic policy. "The policies of the current Palestinian government are improvised and confused in many issues of finance and the economy," it said, according to AFP. Abbas's Palestinian Authority is in serious financial crisis, which Fayyad has several times warned could cause the entity to fail financially and cease to exist. Fayyad has also blamed Israel for the crisis.